Avalon Instruments will be on 9th September 2017 at Villingen-Schwenningen Astronomie-Messe AME. Come to visit our latest products. 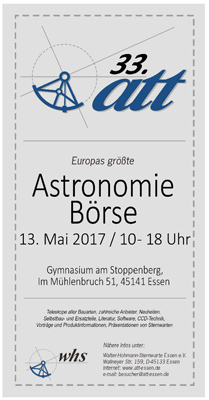 Avalon Instruments will be on 13th may at Essen (Germany) ATT - Astronomie Börse 2017. Come to visit our latest products, you can find us at the Baader Planetarium Stand. Avalon Instruments will be on 10 & 11 February 2017 at European Astrofest 2017 (Kensington Conference and Events Centre). Avalon Instruments will be on 10th october at Villingen-Schwenningen Astronomie-Messe AME. Come to visit our latest products.